Fikri Jermadi gave ‘Second Life of Thieves’ more than a few seconds of his time. Prior to watching this film, I had just finished watching ‘The Imposter’, the excellent Errol Morris-inspired documentary directed by Bart Layton. Predictably, it centred on a protagonist whose identity stealing ways saw him nicknamed the Chameleon back in his native France. Watching ‘Second Life of Thieves’ within the same day brought about thoughts of Woo Ming Jin being the chameleon director of Malaysian cinema, a mark of his ability to shift back and forth between the more mainstream efforts back home and the melancholic, meditative efforts he exports to film festivals worldwide. Of course, film shouldn’t be demarcated merely into the false dichotomy of mainstream and independent, but here provides a useful enough framework for some discussion. ‘Second Life of Thieves’ falls firmly in the latter category. Premiering at the recent edition of Busan International Film Festival, it bears more than just a passing resemblance to his other films, though I’m talking more of ‘The Elephant and the Sea’ than ‘Mamak Cupcake’. Most notably, the profession of protagonists being involved near the sea is interesting. That huge body of water is always waiting to be filled with meaning, certainly within artistic ventures. Going beyond being a cinematic location to shoot in, I wonder whether there are aspects of Ming Jin’s personal life that could be traced to this. Perhaps we should also consider the background of Ming Jin’s collaborator, Edmund Yeo. In addition to being a producer, he is involved as the writer and editor. We’ll get back to him in a short while. We follow Tan (Chong Kok Keong), the head of a small coastal village in Malaysia. Though one suspects his hands are not usually as full, in the film he is going through several issues. One is the death of foreign workers on his territory. He tries his best to solve this, enlisting the help of a local police officer (Azman Hassan), but deep down his heart is breaking: his wife had run away with Lai (Berg Lee), his childhood friend. Sandy (MayJune Tan), Lai’s daughter, turns out to be his unlikely accomplice, as they both try to find out what’s going on. You must know that this film is a complex one, traversing back and forth between the past and present. As such, we also see the younger Tan (JY Teng) and his wife (Emily Lim) in the past, coded by a very subtle shift in colour tone. This film feels like an exposition of those living life on the fringes of society. It deals with secrets, things one do not wish to acknowledge or share with others. The investigation of the death of immigrants was telling in this regard. Their demise is grave, yet the manner in which the context deals with it does not allow for anything more than just a passing thought. This is very deliberate, I feel, mirroring more than just a little the society it is set in; those linked to the dead (such as the immigrant’s employer) are quick to pass on the blame, while not even the police appears to be all that interested. Later in the film, he popped up with an even more revealing piece of dialogue, with more overt links to authoritative failure. This is nothing new, especially in Malaysian independent films. In fact, a recent study suggests an inextricable link between the government and corruption in the country. However, the point remains: that is not what the character actually said, even if it was what he (and the director) meant. Going beyond that, as I write these words it jumps to mind how poetic the film was. It may not be everyone’s cup of tea, and at times the words may fall flat, but that’s only because at other points of the film it set the bar high at invoking certain emotions. In one scene, Lai accidentally came across some pieces of treasure in his fishing expeditions. “Looking for treasure,” Sandy narrates the scene, reflecting “diamond in the rough.” It’s applicable as a reflection of the character’s inner soul. During the enactment of a play in the village, the female character proclaims, “My death will be like a gust of wind, gone without a trace.” Again, a marker for those living on the edge; I feel like I’ve heard this simile before, but it does not make it any less effective, for it echoes throughout the film, hinting at the brief effervescence of life. Therein lies the magic of Ming Jin’s films. I haven’t seen all of his efforts, but of those I have seen, I can’t help but correlate with my own life and experiences. At times, this made the film difficult to watch, and I suspect this will determine your viewing experience. The ability to allow for the audience a connection with not only the characters (especially in a story with shifting perspectives), but also the narrative is rare. 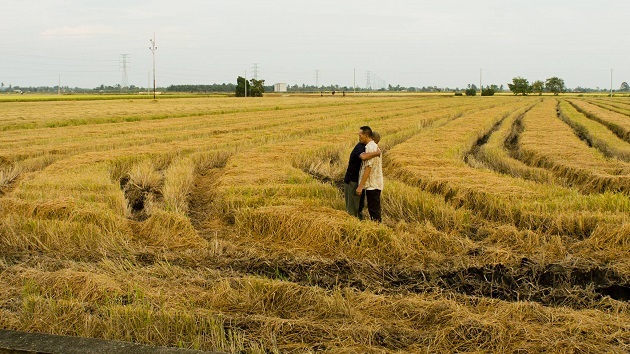 The film is an incredibly melancholic effort that may not suit everyone, but I can’t think of many other filmmakers like Ming Jin, who is as able to make the maximum amount of hay with very little sunshine.